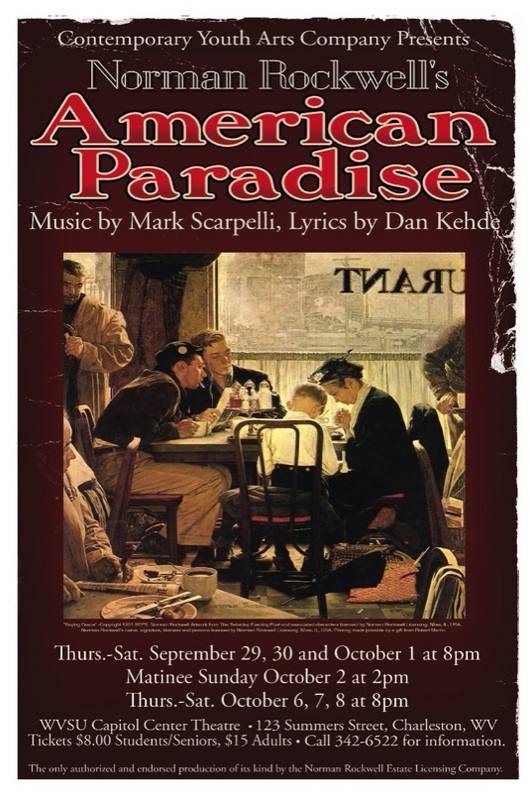 The paintings of famed American artist and illustrator, Norman Rockwell come to life in this musical homage to true artistic genius in Scarpelli and Kehde's "Norman Rockwell's American Paradise". Featuring 27 of Rockwell's iconic works, including many that graced more than three decades of covers for the Saturday Evening Post, this delightful, family friendly musical shows a portrait of America as it wished to be; simpler, more honorable and with a willingness to laugh at ourselves that has been lost in the past few years. This is the America of innocent high school crushes, patriotism and a certain reverence for the American dream. Featuring the talents of Winter Wilcox, Leonie Widmann, Nik Tidquist, Bob Sylvester, Jacob Spruce, Brett Smith, Rubin Shirley, Katrina Scarpelli, Caroline Chamness Rainey, Tara Phares Pauley, Siercia O'Brien, Afton Myers, KW Morrison, Irene Melian, Tess Lucas, Terry Lanham, Kim Javins, Grace Javins, Sheila Jarrett, Blaize Hurlbutt, Jake Guthrie, Patrick Felton, Maddy Gourevitch, Leah Felton, Devin Elliott, Leah Draper, Tayan Cooper, Zene Cooper, Matt Connelly, Shelbi Clark, Lisa Anderson, Tiffany Hoke, Hannah Scarborough, Kristin McMillion, and Molly Sullivan.